Verizon LTE came out just two years ago. Although it was no the first to the party. It sure took it over. Since December 5th, 2010 Verizon has been kicking in doors and taking names. 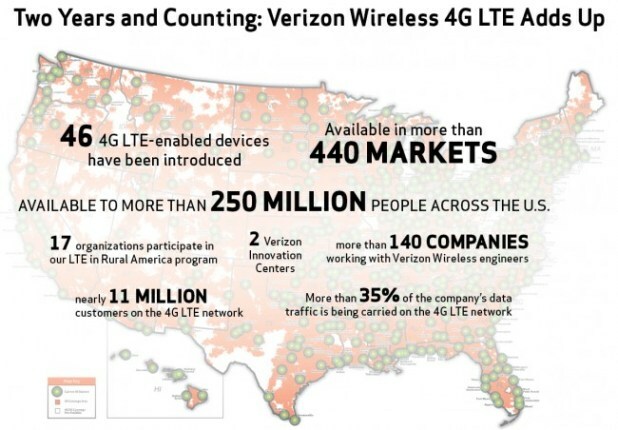 LTE is the standard of the wireless industry and Verizon’s LTE network is the gold standard. It is in 440 markets and over 230 million Americans can get their devices on it. . Verizon is the top ranked carrier in the U.S. according to Consumer Reports. Anniversaries are marked in different ways: some are more subdued and call for reflection, while others are joyous celebrations. On Wednesday, Dec. 5, wireless users may not pause to celebrate that it has been two years since the launch of Verizon Wireless’ 4G LTE network, yet every day they experience how it has transformed their lives. 4G LTE wireless networks mean that what was once considered only in the realm of desktop computers – or someone’s imagination – is now seamlessly mobile. Video is now available from anywhere with mobile streaming. Whether it’s watching user-generated clips, favorite entertainment programs or video chatting with friends and family, the growth of 4G LTE has changed the way we watch and share video. Games can support better graphics and multiplayer options over 4G LTE, and users can take advantage of smart accessories like the Helo TC Touch Controlled Helicopter, a helicopter controlled through a smartphone application. Conducting business as well from a smartphone or tablet, or using a mobile hotspot to connect other devices to a Wi-Fi connection, is increasingly common as entrepreneurs, real estate agents and traveling healthcare professionals can stay in touch with clients and the home office from anywhere. Small business owners are not only sending email and graphic-rich presentations over 4G LTE from moving trains, airports and other locations away from the office, they can also promote their companies effortlessly and instantly through social media accessed and managed on the go. Connected devices, including solutions that monitor home utilities and security, mobile payments and shopping, and vehicle diagnostics, are becoming part of the everyday personal smartphone portfolio. The changes in our mobile lifestyles since the introduction of 4G LTE in just the past two years are worth celebrating, and the advancements on the horizon are equally exciting.